A brunescent, or brown, cataract is often correlated with the maturity of a cataract and can cause decreased visual acuity. Brunescent cataracts can cause poor contrast and color discrimination, especially at the blue end of the visible light spectrum. 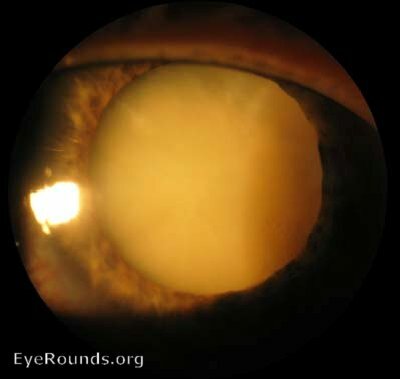 Brunescent cataracts may also have surgical implications, as complication rates for mature, brunescent cataracts, such as posterior capsular tear, are higher compared to other cataracts. Dense cataracts often require longer surgery times, which may compromise the corneal endothelium and result in significant post-operative inflammation. American Academy of Ophthalmology. Basic and Clinical Science Course. Section 11: Lens and Cataract Ed: 2014-2015:39-41. Hatch KM, Talarno JH. Laser-assisted cataract surgery: benefits and barriers. Curr Opin Ophthalmol. 2014;25(1):54-61. Image Comment: Notice there is liquefaction of the lens.